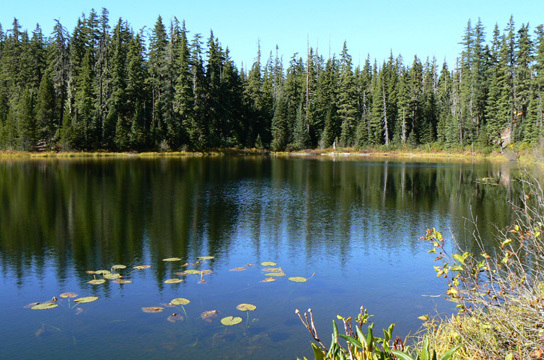 Misc: Abernethy Lake is not stocked, but has a natural production of brook trout. Notes: You will need a high clearance vehicle if you want to drive all the way to the trailhead for this lake. Even then the trailhead is quite confusing, as the railroad and Deer Creek eventually block the road. To find the trail, Cross Deer Creek via the railroad culvert and then head up the Westside of Deer Creek. The trail may or may not be marked at this point. Along the trail you will pass by a smaller lake, only 2 acres and only 8 feet deep; this is sometimes referred to as Lower Abernethy. I doubt because of its depth that it would consistently contain fish. Route: From Eugene take Highway 58 to the Willamette Pass, turning right at Abernethy Road, continue on Rd 5899, turning right on Rd 501, and drive to the end.